← स्थानीय विकास में जन भागीदारी सुनिश्चित कैसे हो ? The technology is based on a bio-conversion process where fundamental reactions of nature, namely respiration, photosynthesis & mineral weathering take place in a media housing micro & macro organisms which bring about the desired purification. SBT is an oxygen supplying biological engine and so the process can treat all types of water – domestic municipal & industrial. SBT is suitable for treating water with salinity <1000 mg/L. The process requires mesophyllic temperatures; so where the ambient temperatures are low/ very low a greenhouse infrastructure appropriate for the local conditions houses the SBT plant. However the process can work at high ambient temperatures. The facilities of a treatment process for water & waste water consists of a raw water tank, bioreactor containment , treated water tank and where appropriate a greenhouse and associated piping ,pumps & electrical. Schematic of the process is shown in process photo below. 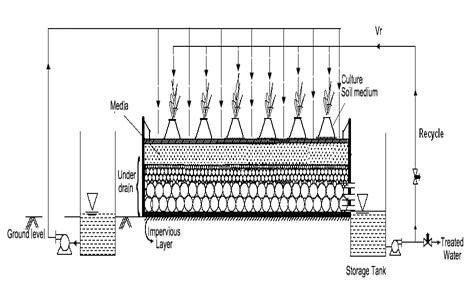 Bioreactor containment houses i) the media , ii) the culture, III) the additives and iv) the plantation required for the bioconversion;. Water or waste water is pumped over the bioreactor; the suspended solids are removed by the top media which is scrapped and discarded into municipal solid waste. The water trickles into the bed and treated water collects in the filtrate tank. Recirculation pumps are provided to obtain desired hydraulic retention times; in general purification to desired quality is achieved in one pass and so these recirculation pumps are not used. The scheme for drinking quality raw water, swimming pool water, rain water & storm water & waste water treatment are identical to description above. 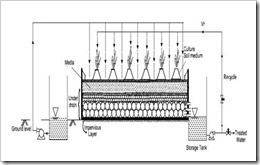 A schematic of multi-level designs; here SBT bioreactor is developed at each level and arrangements for pumping & piping to the different levels are provided. The life span and efficiency increases with passage of time, however once established it has a use-full life of more then 75 years, except that of pumps whose use-full life is around 10-15 years. · No Sludge Disposal, Oil & Grease removal, Looks like a garden. · Operating cost roughly Rs. 8.00 to10 per KL per day. · More than 30 Plants have been set up in user segments such as MES, municipal corporations, hospitals, university campuses, industries, hotels, airport etc. The SBT requires very low energy due to high oxygen transfer in process. Sludge and odour are not produced. Very high removal of bacteria, BOD, COD, suspended solids, is achieved. SBT is practically maintenance-free. Day 1(Bathing quality ) : BOD < 5 mg/l, COD <15 mg/l, Bacteria = 100-0CFU/100ml, DO > 6 mg/l , no colour, No odour, no ammonia, TSS < 9mg/l PH 6.9 to 7.3,After 3 Years of running of SBT plant (quality available is just fit to Drinking) : BOD=0, COD=0, Bacteria = 0, DO > 7 mg/l No odour, No sludge; there is no nuisance of any kind and thus the SBT treated effluent fit for Re-use. SBT also generates carbon credit. Tentative COST bifurcation- sewage treatment plant based on soil Tentative Capacity of Plant: From 5KLd to 20MLD. Electrical facilities Control Panel and Lights / fixtures etc. -as per design requirement. Media & Services: Media is designed depending up on the Lab test results of Sewage/effluent water quality. Design-consultancy, manufacture, transport, Laying Media with implementation, disinfection, additives, supervision & training etc. Approx -3.5 Years (Considering the cost of treated water to be recycled at a cost of Rs. 30per KLD). The water purification plant works on the principle of Soil Biotechnology which applies the biochemistry of nature in a concentrated manner. It aims at enriching soil & extracting excellent water for use in drinking, irrigation, fisheries, industries & construction & fire-fighting. The solid waste facility also uses the same principle to process waste for disposal or for conversion to fertilizer. O&M of pumps & pipes: All pumps should be run daily to ascertain maintenance requirements. All monitors & alarms should be checked daily. All pipe ports should be maintained daily to ensure that water flows out of all the ports. All valves & fittings should be checked and where faulty should be restored. Plantation: The plantation on the bioreactor and surroundings should be regularly watered pruned, replaced and provided with manure as required. Tanks: All tanks should be thoroughly scrapped to remove adhering dirt and washed. Other advantages over membrane type STP’s. · 1. SBT uses only natural materials and it is 100% ecological. · 2. SBT allows user start-stop mode of operation and the plant can be run in intermittent mode, batch mode and continuous mode as per site conditions allowing 100% mission availability under varying conditions. · 3. SBT can easily handle 150% peak loads for a few days by increasing running times as the situation demands. · 4. SBT is capable of tertiary treatment (removal of Nitrogen, Phosphorous and heavy metals). Treated water is antiseptic due to high Dissolved Oxygen levels unlike other treatment technologies. · 5. Most other technologies require users to ship the sludge generated to a disposal station such as a land fill at significant cost not to mention much hassle. SBT avoids sludge generation and treats all of it within the process itself. However a provision for a bio-fertilizer from the process can be arranged should the customer need such a facility for other landscaping use. · 6. One unique aspect of SBT is the incremental improvement in output water quality as the bioreactor beds adjust to the specific influent composition from process. A10 year old SBT plant will routinely deliver superior performance than a new plant. All this with little external input. · 7. No moving parts unlike MBBR, MBR, and Activated sludge process based STP’s numerous motors, stirrers, blowers, clarifier’s pumps etc. · 8. Easy to operate, it can be operated by gardener rather than engineer. The plant displays of high aesthetics and appears like garden. · 9. Low depreciation because of less mechanical equipment. · 10. Conventional treatment plants create a very bad working environment with many noxious fumes. They therefore have to be sited far away from living and working spaces. SBT is completely odourless and the output water is reusable. This technology is much cheaper then installation of normal STP running with Membrane technology, and do not have any problem of sludge disposal. No running expenditure for change of membrane is required. As against running of normal STP on 2 -3 no’s of 5HP electric motors SBT normally runs with total load of 2HP (up to 300KLd) to 5 HP (up to 200KLD). This alone gives a saving in electric bill amounting to approx.Rs2000 per day for 20 hrs. running membrane type STP plant. In addition of saving in cost of Maintenance and running as only one person (Gardener) is required during the day in place of nearly 3 operators required to run the membrane STP plant. In addition it gives an esthetical environment friendly look and generates carbon credit. The SBT plant is generally adorned with specially selected plants to give it a garden like appearance. The garden is not essential but most of our clients and perhaps even you have opted for greenery. There is however a secondary function to the plants: They behave as bio-indicators to the health of the entire process. Toxic waste entering the process will have a detrimental effect to the health of the plants and corrective action can be immediately initiated. Low Sludge: Most other technologies require you to ship the sludge generated to a disposal station such as a land fill at significant cost not to mention much hassle. SBT/CAMUS-SBT avoids sludge generation and treats all of it within the process itself. However a provision for a bio-fertilizer from the process can be arranged should the customer need such a facility for other landscaping use. No Odour: Conventional treatment plants create a very bad working environment with many noxious fumes. They therefore have to be sited far away from living and working spaces. SBT is completely odourless and the output water is not conducive to disease causing insects such as mosquitoes. This entry was posted in ENGLISH SECTION (अंग्रेज़ी प्रभाग), Technical Articles, Water Management and tagged soil bio technology, Waste Water Treatment, water consevation, water management. Bookmark the permalink. i am pursuing an architectural firm , i have to design SBT plant for hundredn residence occupying 350 inhabitants. so any information about documentation and calculation regarding above.